The console team has done it again! Beasts of the Sanctuary: Update 22.20.6 has been sent off to Cert!This update includes content from Update 22.19.0 all the way to Hotfix 22.20.6 (plus some other handpicked goods). And yes, that does mean we’ve included that meaty 22.20.0 update into the mix. Big round of applause to the team who got that mainline monster and more wrapped up into this upcoming PS4 update! 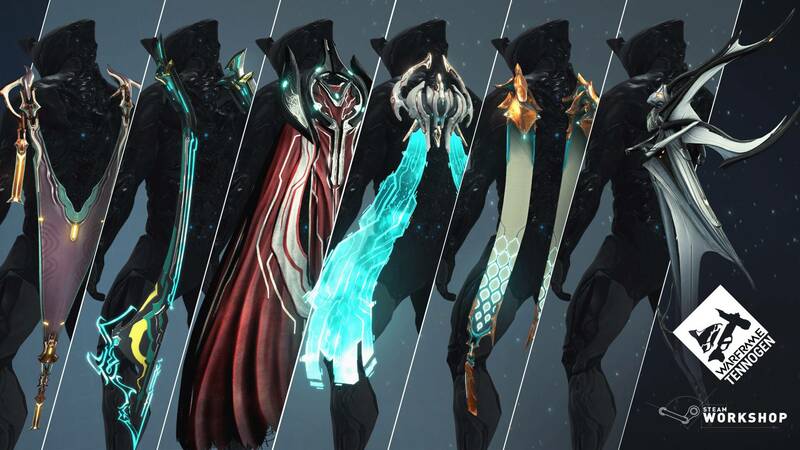 Drape your Warframe in the latest in TennoGen fashion. This Syandana bundle is coming at you from TennoGen Round 12! This is the first TennoGen Round 12 bundle of the batch! All remaining items will be released in future updates. We appreciate your understanding as mainline updates require a lot of attention and care to be launched as soon as possible with the best of quality. We’ve given her many nicknames; the Countess of Corrosion, the Lady of Toxin, the Queen of Viral, the Mistress of Maladies… the list goes on. Well, she’s received the dev workshop treatment and is making an entrance on PS4 with a whole new set of tools on her belt! Saryn will be receiving the following changes from the Saryn Revisited 2.0 and Spores Revisited Dev Workshops, and will also include the PC Hotfix 22.20.7changes! Inflicts target with a pox of Corrosive Spores. Spread Spores to nearby enemies at a base range of 16m by shooting a Spore, hitting an enemy with Toxic Lash active, killing an enemy with or without Toxic Lash active, or on death (on targets you directly cast Spores onto and/or targets affected by Miasma). 2 damage (can be modded with Ability Strength) per enemy infected by Spores every second up to a maximum of 10 enemies. To specify, the number of infected enemies is uncapped! You can infect more than 10 enemies, but the damage growth is dependent on that max. For example: 5 infected enemies would set the damage growth to 10 damage every second (Modded damage growth of x * # of enemies infected up to 10). Reaching 10 infected enemies caps the damage growth at 20 every second. A meter in the bottom right corner of your screen will show the number of infected enemies and the damage per second dealt to the infected enemies. The damage per second you’ve accumulated will first instantly drop by 20%, which will then commence the decay of the remaining damage by 10% per second (affected by Duration mods). Decaying can be observed in the damage per second meter located above Saryn’s ability icons. Drain will occur once per half second. Decay refreshes every .5 seconds. Recast on enemies for a 20% decrease to its damage per second (scales with Ability Strength) for 50% of the Energy Cost. Increased Status Chance from 10% to 50% (scales with Ability Strength). Venom Dose Augment: Spores cast on allies temporarily grant them additional Corrosive damage to all attacks. Shedding her skin like a snake, Saryn leaves a decoy behind to draw fire from enemies. After casting, Saryn receives a momentary speed boost for a short duration. Molt now scales similar to Rhino’s Iron Skin - All the initial damage it takes in the first 3 seconds will make it stronger. Any damage it receives after that point will target the absorbed health. Damage absorbed is shown in a buff indicator at the top of the screen. Once all absorbed damage has dispensed, Molt explodes dealing Toxin damage to nearby enemies. Increased Duration from 30 seconds to 45 seconds. Toxic Lash no longer grants 2 Energy restore when bursting Spores - With the new spreading nature of Spores, survivability of Molt, and the increased duration of Toxic Lash and Miasma, Saryn is not as Energy hungry as she was before! A buff icon for Toxic Lash displays so you can see the bonus (ie: after Growing Power, Energy Conversion, and other temporary power-strength buffs are applied). Contagion Cloud Augment: Kills with Toxic Lash leaves behind a Toxin cloud and Melee kills double the damage dealt by the cloud. Now has a 100% guaranteed Viral Status Effect on damage tick. Increased range from 15 meters to 20 meters (at Rank 30). Increased duration from 4 to 6 seconds. Lowered Energy cost to 75. Miasma inflicts double damage on targets infected by Spores. When recasting on the same enemy it will refresh the tick duration and maintain the Viral Status Effect, but will not stun enemies a second time until the Status Effect ticks have subsided. Decreased damage tick to 300. Made some minor FX updates to Saryn’s Abilities! Spores received a slight improvement to the FX. Reduced the brightness of Miasma. Improved FX to make her Molt cast more pronounced. Saryn is also coming with a whole new set of sounds voiced by [DE]Danielle!! Added Abilities screen stats for Saryn Molt speed buff & duration. Update 22.17.0 brought you Part 1 of the Dojo Remaster series with a new set of decorating tools, functionality, and a whole plethora of Decorations. Suffice to say we’ve been blown away with what you’ve created so far, so why not give you more?! Polychrome has a new function: Room Lighting Controls! Construct and place a Polychrome to explore all the new lighting and fog options for each room in your Dojo! Lasers and pressure-pads that you should avoid at all costs! Dummies you need to kill to complete the course! Over 90 Tenno and Orokin Decorations! EQUINOX CLISTHERT HELMET - When they are night you are day. When they are light, you are the all-encompassing dark. A demon helm befitting a Warframe of savage duality. Wyrm - Negate - Sentinel prevents Status Effects from applying to its owner once every 5 seconds. Djinn - Reawaken - Upon death, automatically revives itself after 90 seconds. Carrier - Looter (reworked original) - Destroys Loot crates within 12 meters. Synthesis Scanner will now show target enemy weaknesses and resistances. Increased the range of Ensnare. Removed the Line of Sight check from Ensnare to make it more reliable. Range Mods now affect Whipclaw's AoE radius, but it is capped. Khora's Whipclaw can now damage decorations (crates, barrels, etc). Khora's Kavat now teleports to a given target instead of pathing there if the target is too far away! Changed Khora’s Venari animations from domestic Kavat to Feral Kavat. Adjusted a number of Syandanas to fit Khora better. Khora’s Whipclaw animation has been updated to better reflect the aim direction. Operators can no longer be targeted for Venari to Heal. This follows precedent with other Warframe Abilities not being castable on Operators. This update also brings experimental cursor changes that are part of the grander UI changes to come in the future. You're already familiar with the Star Chart cursor that allows you to move about the map and select nodes on the fly. Until now, that's been the only place where you can use a free-moving cursor. Well, we've brought that functionality across all UI menus! This includes your Arsenal, Mods, Foundry, Codex, Market, Pause Menu, and much much more. We understand that these are enormous changes for all console players, and especially for those who have been playing Warframe exclusively on console. When the changes go live, it will definitely require some practice before you've got it nailed down and can cruise around the UI with no problems. There will be quite a bit of muscle memory to work against, so to better prepare you, we will be posting a Dev Workshop that will detail the changes coming to console (and upcoming changes for PC controller users). The Dev Workshop has been posted! No longer shall you go without dazzling FX as new GPU Particles are coming with a large library of Warframes, Weapons, and more! Responding to game physics and gravity. Responding to explosions and collisions. When the update goes live you can enjoy GPU Particles at varying intensities that can be changed in your "Display" Options: Disabled/Low/Medium/High... LUDICROUS*! *Ludicrous setting is only available on the PS4 Pro! The Operator screen will display a new opening UI! Switch between Equipment, Focus, and Appearance. Added a North indicator to both the Plains of Eidolon minimap and Advanced Map. Added the ability to replay the Once Awake quest ! Added a 'CLAIM ALL' button to the Foundry that appears when you have more than 1 item ready to Claim. Added Growing Peculiar Mod to Onslaught rewards! Damage causes enemy to inflate. Weekly Leaderboards will now show a reset timer! Real-time audio mixing is now handled by our new RTPC (Real-Time Parameter Control) system, which allows greater precision and control of the game-wide mix. Reduced explosion radius from 6m to 4m. Lowered the Tusk Bombard’s base health from 350 to 300. Reduced explosion radius from 10m to 4m. Reduced lifetime of fire explosion FX from 10s to 7s. Added a damage element to those fire FX - Minor Heat damage and Heat proc if touched. You will be able to engage in more cerebral combat with the Scrambus/Comba enemies using visual cues to take them down - their Nullify aura has been replaced with a power that they can activate in combat. Upon use, it creates an expanding sphere that nullifies players’ Abilities, and disrupts them for 2.5 seconds. Similar to Nullifiers, shooting off a Scrambus/Comba's helmet will negate the sphere. Increased mounted Dargyn projectile damage from 250 to 450 and increased the clip size from 50 to 75. Increased the spawn frequency of Dargyn patrol and idle Dargyn encounters when roaming the Plains. Shooting the Pilot, causing the Dargyn to float to the ground for boarding. Using Loki’s Switch Teleporton the Pilot. Using a finisher from behind while using Archwing, allowing you to transition from Archwing to Dargyn. The Spear Fishing HUD has received a more sophisticated look and function. Selecting a Spear in your Gear wheel will open the Fishing HUD where you can switch between Spear, Dye, and Bait on the fly. Onslaught mission Credits will be rewarded every 2 successful Zones. This eliminates being able to achieve free Credits in the initial spawn room by letting the timer run out. Helpful tool-tips have been added to guide you in your cinematic production. Melee head kills will count as headshots (they already counted towards the "Get 10 headshots" challenge). Melee attacks will freely pass through enemies in Range (i.e an enemy cannot block another enemy from being hit). Numerous weapons have received the PBR treatment! Harrow’s Condemn, Thurible, and Gara’s Shattered Lash (stab) will be usable on ziplines. Gara’s Splinter Storm will apply a HUD buff when cast on self to help manage when casting on many targets. Eidolon Lures will wait until the Eidolon has fully disappeared to be auto-destroyed, instead of being auto-destroyed when the sun rises at dawn. Increased time given by targets in the Round 11 Mastery Rank Test from 3.5 seconds to 5 seconds and added aim assist to targets to make them slightly easier to hit. Crouching will be stateful! If you let go of crouch while in a small tunnel, your Warframe will now stand up when it can.You will also be able to crouch while parrying. Updated several ability stat descriptors to make them clearer. Syndicate Pickups will be auto-marked on the first pickup! You will be able to purchase multiple copies of Arcane Blueprints in Hok and Quills Offerings. Updated naming filter to allow players to use appropriate words that contain inappropriate words, like “assassin”. Removed profanity filter from Loadout names. Exodia Contagion’s Infested grenade 30 meter damage multiplier will also take into account your combo multiplier. Exiting the Relic selection menu will count as a non-vote instead of a decline. Previously ‘Exiting’ from the Relic selection screen counted as "declining" the mission, which you could not undo unless you left the squad, or the mission is cancelled entirely. Fixed End of Mission rank being A- when aborting before a Zone has been completed. Fixed being left behind if you jumped through the Onslaught Conduit and the timer ran down as you were still transitioning. Fixed kills made by Mirage's Hall of Mirror clones not contributing towards Onslaught Efficiency. Fixed Gara’s Splinter Storm not refunding Energy if the target dies during the cast animation. Fixed being unable to Chat link Dokrahm, Rabvee or Sephfan Zaws. Fixed cases of Beam weapons not doing damage inside Limbo’s Stasis. Fixed max Ranked Arcanes appearing grayed out in the Codex if you didn’t own a separate Unranked one. Fixed transferring to Operator while sprinting causing inability to toggle sprinting off as Operator. Fixed Panthera’s Punch Through not going through enemies. Fixed weapons like the Opticor having its hits blocked by your companion. Also fixed the hits sometimes not taking effect if other geometry was nearby. Fixed Drones not following players if they are riding on a Dargyn. Fixed Kuva Survival Catalyst pickups sometimes getting stuck in a fall-teleport loop. Fixed Knell gaining multiple procs for a single shot on Client. Fixed Rivens not unveiling in Cetus/Relays if you have unread Inbox messages. Fixed Chroma’s Spectral Scream Energy stat on Abilities screen displaying as 0 after you've used it once. Fixed Chroma’s Spectral Scream breaking if you run out of Energy while in Operator. Fixed Nezha’s Reaping Chakram damage not getting doubled for every enemy hit for Clients. Well the new UI controls need a LOT of work to be improved. I had a bad feeling it was going to be similar to the new PC hybrid controls and it is, unfortunately. You are now basically using the left analogue stick as a mouse to control your cursor (slowly) to move over and then select many of your options. Equipping, upgrading and changing the appearence of Waframes, weapons and companions in your Arsenal screen now has no functionality for the shaped buttons apart from R2 for abilities so you now need to move the cursor to the section, then the particular menu then scroll with the right stick and then move the corsor with the left or the box with the d-pad and then 'double-click' the X confirmation button to select your new frame or whatever. No where near as quick and intuative as it was previously. It is by no means the end of the world but there is little d-pad functionality at the moment and you also seem to have to use combinations of sticks and d-pad to scroll down menus where before you just used a direction on the d-pad. I know this is all under review and they are accepting feedback, and I'm sure in the long run there will be an excellent hybrid system for both PC and console that will work great on the new UI in the future but this really seems like many steps backwards at the moment to me. Haven't checked out the new LUDICROUS particles setting much yet but I'm sure it looks nearly as good as the PC ones. New Sentinel mods seem useful and means I will go back and relevel and check out these Sentinels again for at least a little while and possibly find reasons to keep them around.